Voluntary Simplified Issue Term to 100 with Accelerated Benefits. 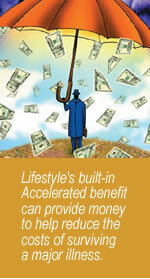 RICHEST commission schedule for a voluntary life product! Meet YOUR GROUP'S & ASSOCIATIONS NEEDS! Fill the void in their employee benefits package. Employers will appreciate you for bringing these valuable employee benefits to their attention. This product requires Minimal service for your agency.